Walter McNeely never became a doctor, as was his ambition, but he helped many other young people achieve their career goals. McNeely, 79, was born in Millen, growing up at a time when professions for African Americans were limited. “It was preacher, teacher or one doctor out of a thousand,” he says. 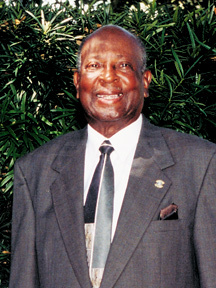 After a brief stint in the Navy near the end of World War II, McNeely graduated from Fort Valley State College with a bachelor’s degree in chemistry and physics and hopes of medical school in his future. It was not to be. Education became McNeely’s career. He taught at Glynn County’s Risley High School, first teaching high school chemistry and physics, and coaching football, girls’ basketball and track, before climbing the administrative ladder. Many years of his service to the school system were under what he described as “adverse conditions,” relating to segregation and its nasty side effects. In 1971, Glynn County Schools desegregated. McNeely presided over the breakup of Risley High School as half of his student body was sent to Glynn Academy, the other half to Brunswick High School. By the end of his education career – he retired in 1994 – McNeely had been a classroom teacher and principal, as well as assistant, associate and interim school superintendent for Glynn County Schools. Upon his retirement, McNeely ran for the school board and served for another six years. But there was more in store for him. A nephew, a former investigator for the state of Georgia that McNeely “partially reared,” moved back to the Brunswick area and opened a bonding business. McNeely was a partner in Brunswick Bail Bonding when his nephew died suddenly. “We had a lot of bonds out,” McNeely says. “I had to get on it or we would lose money.” He remains active in the business to this day, though his work schedule is timed to accommodate his fishing schedule. Most mornings McNeely launches his boat from the marina on St. Simons Island and fishes in front of the King and Prince Hotel. On a good day, he brings in close to 100 whiting or maybe the limit on speckled trout or red sea bass.